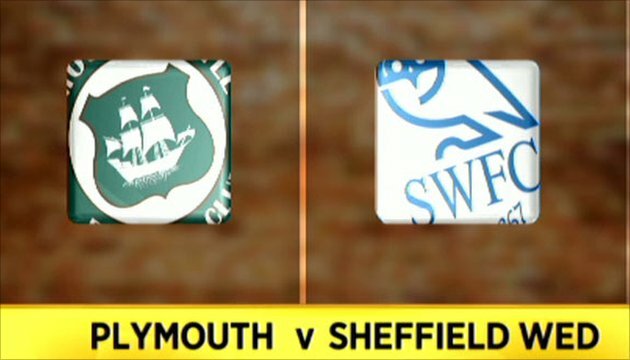 Craig Noone's goal gave 10-man Plymouth victory over Sheffield Wednesday. Argyle took the lead after Bradley Wright-Phillips found Carl Fletcher, who drove in from 20 yards. James O'Conner then equalised with a powerful header, and minutes later Bonds N'Gala saw red after he fouled Neil Mellor when clean through on goal. But Wright-Phillips headed Argyle back in front after the break, and despite Tommy Miller's superb volley to level the game, Noone's header settled it. "I've played for some good side and I've managed some good sides, but I can honestly say I was so proud of the team out there. "I thought they were absolutely fantastic, a few things went against them, but the way they dug in was absolutely brilliant. "They played with no fear and that's the biggest thing for me, they looked a confident side and they looked strong." "Some of the things that happened just should not have happened. They were unacceptable. "Conceding goals, poor defending and not having the right mentality. That's what I'm bitterly disappointed about. "You learn lessons all the and I'm learning lessons about my players that's why I'm disappointed." 90:00+4:54 Free kick awarded for a foul by Kari Arnason on Giles Coke. Direct free kick taken by Darren Purse. 90:00+2:41 Free kick taken by Reda Johnson. 90:00+2:41 Booking Nicky Weaver is shown a yellow card for unsporting behaviour. 90:00+2:37 Booking Carl Fletcher is shown a yellow card. 90:00+1:25 Booking The referee cautions Neil Mellor for unsporting behaviour. 90:00+1:24 Foul by Neil Mellor on Onismor Bhasera, free kick awarded. 90:00 The referee blows for the end of the match. 88:16 Substitution Craig Noone leaves the field to be replaced by Jack Stephens. 88:03 The assistant referee signals for offside against Clinton Morrison. Romain Larrieu takes the free kick. 84:47 Darren Purse has an effort at goal from deep inside the area missing to the right of the target. 84:24 Corner taken short by Daniel Jones, Krisztian Timar manages to make a clearance. 82:59 Daniel Jones takes the inswinging corner, save by Romain Larrieu. 82:00 The assistant referee flags for offside against Clinton Morrison. Free kick taken by Romain Larrieu. 81:35 Handball decision goes against Steven MacLean. Darren Purse restarts play with the free kick. 79:47 Substitution Tommy Spurr leaves the field to be replaced by Daniel Jones. 76:16 James Paterson provided the assist for the goal. 76:16 GOAL - Craig Noone:Plymouth 3 - 2 Sheff Wed Craig Noone finds the net with a headed goal from inside the six-yard box. Plymouth 3-2 Sheff Wed.
74:19 Craig Noone produces a left-footed shot from just outside the penalty area that goes harmlessly over the target. 74:19 Substitution Steven MacLean on for Bradley Wright-Phillips. 74:19 Assist by Lewis Buxton. 74:19 GOAL - Tommy Miller:Plymouth 2 - 2 Sheff Wed Tommy Miller finds the back of the net with a brilliant goal from long range to the top right corner of the goal. Plymouth 2-2 Sheff Wed.
72:03 Headed effort from inside the area by Marcus Tudgay misses to the right of the goal. 70:36 Shot from just outside the area by Bradley Wright-Phillips goes over the bar. 69:31 Marcus Tudgay has an effort at goal from outside the box which goes wide right of the target. 68:42 Free kick awarded for a foul by Mark Beevers on Bradley Wright-Phillips. Onismor Bhasera restarts play with the free kick. 68:15 The assistant referee signals for offside against Bradley Wright-Phillips. Nicky Weaver takes the indirect free kick. 64:09 Marcus Tudgay takes a shot. Save by Romain Larrieu. Tommy Spurr takes the inswinging corner, Kari Arnason manages to make a clearance. 61:52 Substitution (Sheff Wed) makes a substitution, with Tommy Miller coming on for Chris Sedgwick. 61:52 Substitution Clinton Morrison replaces Darren Potter. 59:28 Foul by Marcus Tudgay on James Paterson, free kick awarded. Onismor Bhasera takes the direct free kick. 57:42 Bradley Wright-Phillips fouled by Mark Beevers, the ref awards a free kick. Free kick crossed left-footed by Craig Noone from right channel, Marcus Tudgay manages to make a clearance. 52:43 Bradley Wright-Phillips takes a shot from deep inside the box clearing the bar. 47:06 Onismor Bhasera challenges Chris Sedgwick unfairly and gives away a free kick. The free kick is delivered right-footed by Darren Potter from right wing, clearance made by Krisztian Timar. 45:32 The assist for the goal came from Craig Noone. 45:32 GOAL - Bradley Wright-Phillips:Plymouth 2 - 1 Sheff Wed Bradley Wright-Phillips finds the back of the net with a headed goal from inside the penalty area. Plymouth 2-1 Sheff Wed.
45:01 Substitution Marcel Seip on for Rory Patterson. 45:00+3:21 Sent off Red card for Bondz N'Gala. 45:00+2:36 Free kick awarded for an unfair challenge on Neil Mellor by Bondz N'Gala. Tommy Spurr delivers the ball from the free kick left-footed from left channel. 45:00+1:09 Darren Potter challenges Craig Noone unfairly and gives away a free kick. Onismor Bhasera takes the direct free kick. 45:00 The referee calls an end to the first half. 44:25 Foul by James O'Connor on Kari Arnason, free kick awarded. Romain Larrieu restarts play with the free kick. 42:54 Unfair challenge on Carl Fletcher by Marcus Tudgay results in a free kick. Romain Larrieu takes the direct free kick. 42:00 Free kick awarded for an unfair challenge on Tommy Spurr by Bradley Wright-Phillips. Free kick taken by Darren Purse. 40:45 Darren Potter has an effort at goal from long range that misses to the right of the target. 39:36 Onismor Bhasera fouled by Chris Sedgwick, the ref awards a free kick. Romain Larrieu restarts play with the free kick. 37:07 Assist on the goal came from Giles Coke. 37:07 GOAL - James O'Connor:Plymouth 1 - 1 Sheff Wed James O'Connor grabs a headed goal from inside the penalty box. Plymouth 1-1 Sheff Wed.
35:15 Free kick awarded for a foul by Bradley Wright-Phillips on Mark Beevers. Free kick taken by Nicky Weaver. 32:18 Free kick awarded for an unfair challenge on Mark Beevers by Rory Patterson. Nicky Weaver restarts play with the free kick. 28:32 Reda Johnson gives away a free kick for an unfair challenge on Darren Purse. Nicky Weaver takes the direct free kick. 27:50 Lewis Buxton concedes a free kick for a foul on James Paterson. The free kick is swung in right-footed by Carl Fletcher, clearance made by Marcus Tudgay. 25:54 The official flags Bradley Wright-Phillips offside. Nicky Weaver restarts play with the free kick. 25:23 Rory Patterson concedes a free kick for a foul on Darren Potter. Direct free kick taken by Darren Purse. 23:39 The ball is crossed by Tommy Spurr, Header on goal by Giles Coke from inside the box goes harmlessly over the target. 23:39 Booking The referee shows Krisztian Timar a yellow card. 23:31 Krisztian Timar concedes a free kick for a foul on Neil Mellor. 21:32 Free kick awarded for a foul by Bradley Wright-Phillips on Tommy Spurr. Giles Coke takes the direct free kick. 19:50 Inswinging corner taken left-footed by Tommy Spurr. 18:49 Assist on the goal came from Bradley Wright-Phillips. 18:49 GOAL - Carl Fletcher:Plymouth 1 - 0 Sheff Wed Carl Fletcher gets on the score sheet with a goal from outside the box to the bottom left corner of the goal. Plymouth 1-0 Sheff Wed.
17:41 Craig Noone has shot on goal from just outside the box which goes wide of the right-hand upright. 16:58 Craig Noone takes the outswinging corner, clearance made by Marcus Tudgay. Correction - 11:54 Corner taken by Darren Potter, save by Romain Larrieu. 11:54 Outswinging corner taken by James O'Connor from the left by-line, Romain Larrieu makes a save. 11:16 Header by Rory Patterson from deep inside the penalty area misses to the left of the target. 10:54 Bradley Wright-Phillips takes a shot. Save by Nicky Weaver. 9:36 Bradley Wright-Phillips takes a shot. Save made by Nicky Weaver. 7:54 Corner from the left by-line taken by Craig Noone, clearance made by Mark Beevers. 6:25 Corner taken left-footed by Craig Noone from the left by-line, Krisztian Timar has a headed effort from close range and clears the bar. 5:46 The ball is crossed by Giles Coke, Neil Mellor produces a header from inside the area that goes over the bar. 4:53 Inswinging corner taken left-footed by Tommy Spurr played to the near post, clearance made by James Paterson. 3:47 Outswinging corner taken from the left by-line by Craig Noone, Effort from deep inside the area by Krisztian Timar misses to the left of the target. 2:50 Inswinging corner taken by Darren Potter. 1:09 Marcus Tudgay fouled by Bondz N'Gala, the ref awards a free kick. Free kick taken by Mark Beevers.